Flying Lizard Motorsports 2009: Mosport - Raceday! 5:39 - The No. 21 Panoz was able to get past Johannes to move into sixth. Johannes now 7th. 5:37 - The No. 62 Ferrari in P2 is putting a lot of pressure on the No. 3 Corvette, which is in the lead, but has been unable to pass. In the No. 45, Joerg is P5, in the No. 44, Johannes is P6. 10 minutes left. 5:30 -The No. 21 Panoz, in seventh, is three seconds behind the No. 44, in sixth and putting pressure on Johannes. 5:23 pm - A tussle between the No. 3 Corvette and the No. 62 Ferrari for the lead. the No. 62 and the No. 3 had both pitted, the No. 3 was now in the lead and the No. 62 Risi attempted to pass when they made contact. The No. 62 was unable to pass and is second. The No. 4 Corvette is in third. the No. 87 is fourth. No. 45 is fifth, No. 44 is sixth. 23 minutes left to go. The No. 62 is still running close behind the No. 3. 5:12 - No. 45 pits for tires and fuel. He is back out again still in P5. 5:10 - No. 44 pits for tires and fuel. He should hold his position and remain P6. 5:09 - Now the No. 62 and the No. 3 Corvette are racing each other as the No. 3 tries to pass to take the lead. In the No. 45, we'll be in a few minutes for tires and fuel. the No. 44 will also be in. This should be our last stop of the race, if all goes as planned. Just over 40 minutes left. The No. 45 is P5, the No. 44 P6. The No. 45 is one lap down on the leaders. 5:04 - One of the Corvettes (the No. 4) which was in p1, just went flying off track and lost the lead. the No. 62, now in the lead is fighting hard to hold off the No. 3 Corvette, which is now P2. he was able to rejoin, but is now P3, and is physically behind Joerg on the track, but the No. 45 is still one lap down from the No. 4. 5:00 - The No. 87, which was in P4, is in the pits. 4:48 - The No. 62 (in P2), the No. 3 (in P3),and the No. 87 (in P4) are now by the No. 45, and are now 2 laps ahead. Joerg is in P5, Johannes is P6. 1 hour left to go in the race. 4:45 - Speeding violation for the No. 92 on leaving the pits - stop and go under green. Positions are: P1 No. 4; P2 No. 62; P3 No. 3; P4 No. 87; P 5 No. 45; P6 No. 44. The No. 62 Risi Ferrari, the No. 3 Corvette, and the No. 87 Porsche are all physically behind the No. 45 on track, although 1 lap ahead. All four cars are running nose to tail. 4:42 - The No. 4 Corvette, the GT2 leader, is now by Joerg, and is now 2 laps ahead. The no. 62 Risi Ferarri is by the No. 3 Corvette- moving into second. the No. 62 Risi Ferrari is now physically just behind Joerg, but is one lap ahead. the No. 92 BMW, which was in fifth, and at the front of the GT2 train, is now in the pits for their driver change, which puts Joerg into fifth. They have the hood off and are looking at the engine. 4:30 - Both Corvettes have passed the No. 62 - to take the lead. Positions: P1 No. 4; P2 No.3; P3 No. 62; P4 No. 87; P5 No. 92; P6 No. 45; P7 No. 21; P8 No. 44. Cars 62 through 87 are on the same lap. Cars 92 through 21 are on the same lap, one lap down. the No. 44 is 2 laps down on the No. 4. 1 hour 20 minutes left in the race. Physically, on track, they are still a freight train of GT2 cars - the No. 92 is first of the group, followed by the No.45, then the No. 4 and No. 3 Corvettes, then the No. 62 Risi Ferrari - all basically nose to tail. the No. 87, which is in fourth, has also caught the pack and is close to the No. 62, which is in third. 4:25 - Joerg, in sixth is coming up on the No. 92 BMW in fifth, which is for position. The No. 62 Risi Ferrari, one lap ahead, is right behind the No. 45. The No. 92 BMW and the No. 40 made contact on course as the No. 92 passed, but they continued wihthout incident. the No. 87 has loose bodywork. Positions: P1 No. 62; P2 No. 4; P3 No. 3; P4 No. 87; P5 No. 92; P6 No. 45. Physically on track, the No. 92 is at the lead of the pack, the No. 45 is second, the No. 62 is third, and both corvettes are right behind the Ferrari - all five cars are nose to tail, although the No. 92 and the No. 45 are one lap down. 4:19 - Green flag. Joerg is P6, Johannes is P8. Positions: P1 No. 62; P2 No. 4; P3 No. 3; P 4 No. 87; P 4 No. 92; P6 No. 45. the No 62 Risi Ferrari, which is one lap ahead of the No. 45, is physically just behind us on track. 4:18 - Lights out on the safety car - green this time by. 4:17 - Still yellow - Johannes pits in the No. 44 for another fuel top up. He is in P8 right now. 4:14 - Joerg radios in that it's raining on track. 4:12 - The No. 40 Ford is slow on course. Still yellow. 4:08 pm - The No. 44 is pitting for a fuel top up. A second group of GT2 cars is now pitting for their driver changes (the No. 11 Viper, etc.) Still yellow. Positions: P1 No. 62; P2 No. 4; P3 No. 3; P4 No. 87; P5 No. 92; P6 No. 45. Johannes in the No. 44 is now P10. the No. 45 is one lap down on the top 4 GT2 leaders (No. 62 through No. 87). 4:03- The GT2 leaders are starting to pit - the No. 62, No. 87, No. 4, No. 3 - all four of those GT2 cars are on the lead lap. The No. 11; No. 40; No. 92 and No. 45 are on the same lap , one lap down. Still yellow. 3:58 - The No. 45 is now P8 and the No. 44 P10. Full course caution. Pits are closed. I expect both Lizard cars will pit again under yellow for a fuel top up. The No. 45 is 1 lap down on the GT2 leaders, and the No. 44 is 2 laps down. The waveby has not yet started, but it doesn't appear that the No. 45 will get a waveby, so they will not be able to get their lap back. 3:57 - Big accident on track - looks like the No. 16 Mazda - double yellow. Bad luck, bad timing for the Lizards since both of our cars just pitted under green and were the first of the GT2 cars to pit. The driver appears ok.
3:56 - The No. 44 is in the pits. Johannes is in the car and is out quickly with new tires and fuel. So far, no cautions yet in the race. 3:52 - Early pit stop for the No. 45 for a driver change to Joerg, tires and fuel. They had to bring him him becuase Patrick could no longer see out the windshield because of the amount of oil on it. They are doing a windscreen tearoff to give Joerg a clean window. Darren is also reporting oil on his windshield. They will pit him shortly for tires, fuel and windscreen tear off and driver change to Johannes. They are the first of the GT2 cars to pit for driver change. Darren was hit at some point by a prototype so the crew will also look to make sure no damage. 3:50- The No. 87 has passed the No. 3 Corvette and moved into third. 3:46 - The No.62 Risi Ferrari, in second, has now caught the No. 4 Corvette in the lead and they are nearly nose to tail. Patrick radios in that he has oil on the windshield and cannot see. Darren is in 8th again and is stuck behind the No. 11 Viper,which has a lot more straight line speed. 3:43 - The No. 87 has passed the No. 45 and is in P4. Patrick is now P5. Positions: P1 No. 4 Corvette; P2 No. 62 Risi Ferari; P3 No. 3 Corvette; P4 No. 87 Farnbacher Loles Racing Porsche; P5 No. 45; P6 No. 40; P7 No. 44. 3:38 - Positions: P1 No. 4 Corvette; P2 No. 62 Risi Ferrari; P3 No. 3 Corvette; P4 No. 45; P5 No. 87. The No. 3 Corvette is slowing and Patrick is getting closer to him. the No. 87 is right behind Patrick. Darren is now P7 in the No. 44. 3:34- Patrick is again stuck on track behind one of the BMWs, which is not on the same lap. 3:28 - The No. 62 Risi Ferrari just passed the No. 3 Corvette to take second. The No. 4 Corvette now has a substantial lead and has built a good gap to the rest of the GT2 field. The No. 62 Risi Ferrari in second appears to be determined to reel him in though. Patrick, in second, is back on the pace and is focused on catching the No. 3 Corvette, which is in third. In the No. 44, Darren is in eighth. 3:25 - We now see the TV replay - looks like both the BMW and the No. 45 were in the wrong place at the wrong time, and had no place to go to avoid a collision when the Autocon prototype slowed on course and turned in. Patrick is still out and is slowing slightly but appears to be OK. Positions: P1 No. 4; P2 No. 3; P3 No. 52; P4 No. 45. 3:22 - We aren't sure yet what happened, but the No. 90 has significant damage on the rear, and No. 45 has damage on the front. Patrick radios in that the Autocon prototype stopped in the road. the No 90 was ahead of Patrick on the track and came up on the stopped car first and hit the brakes, Patrick went into the back of the No. 90. The No. 90 has pitted. Patrick is still out. So far, no evidence of radiator damage. Patrick is now P4. Positions: P1 No. 4; P2 No. 3; P3 No. 62; P4 No. 45. Darren is P9. 3:20 - Positions: P1 No. 4; P2 No. 3; P3 No. 90; P4 No. 62; P5 No. 45. Darren is now P9. Patrick radioedin that he may have radiator damage. Not sure what caused it. 3:19 - The No. 62 has passed the No. 45 to move into fifth. Now both the No. 62 and the No. 45 have passed the No. 92 BMW. Patrick is now P5. Risi is P4. The No. 92 has pitted, apparently for tires. 3:17 - The No. 3 Corvette has passed the No. 92 BMW to take second. The Corvettesare now running 1 and 2. The No. 62 Risi Ferrari has passed the No. 40 to move into sixth and is right behind Patrick in the No. 45. In the No. 44, Darren has passed the Viper to move into tenth. 3:13 - The No. 4 Corvette has taken the lead, with the NO. 92 BMW in second. The No.3 Corvette is P4 and the No. 90 BMW is P5. Patrick is being held up by the No. 90 but is unable to pass. The No. 40 Ford is right behind Patrick, and the NO. 62 Risi Ferraris is right behind the No. 40. 3:11 - Patrick is now right on the tail of the No. 90 BMW, which is just behnd the No. 3 Corvette. There's a bit of gap between the two Corvettes. 3:07 pm - A clean start for the entire field. The No. 87, which started last, has moved up several positions. The No. 92 is holding P1, No. 4 Corvette Now P2; No. 3 Corvette now P3, No. 90 BMW is P4. Patrick is P4 in the No. 45 and Darren is P11 in the No. 44. The No. 62 has moved up to P7 and the No. 87 has moved up to P8. 3:05 pm ET - Green flag. Darren is starting from ninth, Patrick from fifth. It is a double file start. 3:02 - The cars are rolling down the front straight for one pace lap. Darren Law is in the No. 44, Patrick Long in the No. 45. 2:55 pm - 10 minutes to race start, pace laps will start shortly. Some heavy sprinkles - it's going to make for a slick track. Hopefully the rain will hold off. 2:20 - The cars are all on the grid. Starting GT2 positions: P1 No. 92 BMW; P2 No. 90BMW; P3 No. 4 Corvette; P4 No. 3 Corvette; P5 No. 45; P6 No. 21; P 7 No. 40; P8 No. 11; P9 No. 62 Risi Ferrari; P 10 No. 44; P 11 No. 87 Farnbacher Loles Racing Porsche. It's cool and breezy with heavy cloudcover and a few sprinkles - hopefully the rain will hold off through the race. 2:13 - Both the No. 44 and No. 45 are back out on track before pit lane closed. They are heading to the grid now. Light rain is falling. Both cars are on slicks (their qualifying tires), but can start on rain tires if needed - the crew will have them at the grid in case they need them. 2:10 pm - Green flag - pit exit is open. The No. 44 and No. 45 are out on track for their recon laps. They will both pit for fuel and their race tires, then do another recon lap and heading to the grid. 2:05 pm - We are five minutes from the start of recon laps. Both Lizard Porsches are in their pit stalls waiting for pit exit to open. Once the exit is open, they will do two recon laps, and assuming all is well, will proceed to the grid. Patrick Long will start fifth on the grid in the No. 45 and Darren Law will start tenth on the grid, just behind the No. 62 Risi Ferrari (which crashed during practice yesterday and was not able to make qualifying.) The No. 44 will start at the back because Darren was not able to make either practice session on Saturday. Reminder that we are broadcasting our team radio - go to "Follow the Race" tab on the home page for details. In the U.S., the race is broadcast live on SpeedTV. 9:40 am ET - Checkered flag on the morning warmup session. Joerg is now P1 in the session, a 1:19.659. Both Lizard Porsches are safely back in their pit stalls. The crew will work on pit stops, then head back to the garage for final prep before the race. We'll be back with you around 2:45 for this afternoon's race, which starts at 3:05 pm ET. 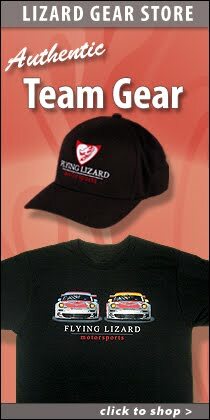 We'll be broadcasting our team radio live during the race - you can listen in at www.lizardms.com. The race will be broadcast live on SpeedTV. 9:35 - Green flag - the No. 87 has been removed - just under five minutes left in the session. Joerg is now in the No. 45, Darren still in the No. 44. 9:26 - The No. 87 Farnbacher Loles Racing Porsche is in the wall at Turn 1. Heavy hit. On TV, we can see the driver (Dirk Werner) who appears to be OK, but he is unable to continue. Red flag. This may be the end of the session as they'll need to get the No. 87 on the rollback. 9:25 - Patrick pits for fuel. He reports that the tires are just starting to come in now. 9:20 - Patrick is back in the pits and will go out on slicks this time. The No. 44 is also back in the pits for another set of tires. Both drivers are working on warming up the tires on the green track. The No. 62 has reappeared on track - the car had a heavy impact with the wall in afternoon practice and did not make yesterday's qualifying session. 9:17 am - Both Lizard Porsches are in the pits for tire changes. the No. 45 is out on wets, the No. 44 on slicks, I believe. 9:15 am - Green flag on the morning 25 minute warmup, a combined GT/prototype session. Patrick and Darren are both heading out on wets. 9:10 am ET - Good morning from Mosport. It's cool and damp this morning at the track. It's not raining at the moment, but some dark cloudcover might mean some rain in the next hour or so. Morning practice begins at 9:15 am. Darren has arrived from Montreal so he'll run the warmup in the No. 44 to get acclimated. Patrick is in the No. 45 ready to head out. Both cars are on rain tires. If the rain holds off, I expect they will both switch to slicks once the field has done a few laps and dried out the track.